We've been waiting for quite some time for a tablet made by Nokia, but the ex-biggest cell phone manufacturer hasn't answered our prayers yet. They are so cruel! Anyways, there have been a number of rumors pointing at an incoming Nokia tablet, and while we're yet to see such a device be announced, we're happy to report that today we've witnessed what's probably the most obvious indication that such a device is indeed coming. We would consider any option… It is important to note that the opportunity for companionship is something that any user is looking for. So, when you think about the Lumia 920, running on Windows phone, having a Windows tablet or PC or Xbox is something that will give us the opportunity to have a pretty integrated experience. Our first focus on what we look at is clearly in the Microsoft side... But we have made no decision or announced nothing. So, there you have it, guys, even though Nokia is considering all possible options for a tablet OS, if such a device does indeed come to the market, it will most probably be powered by Windows Phone. Happy about this? Feel free to share your opinion in the comments! Ooh... A Nokia mystery! !! Just do the same for phones. Make Sailfish and Windows phones. I agree that they should go with Windows to make all their products integrated and less fragmented. I think they should make Android phones and Windows tablets. You have 2 top contenders for phones and many more for tablets. Plus, there really isn't a good Windows 8 tablet per value on the market yet. I agree, MS Surface isn't really the best tablet on the market right now. Although its specs are not impressive, it's also the first Windows RT tablet. I think that Nokia is trying to capitalize on the Surface's strengths and weaknesses and hopes to have have an integrated consumer experience by releasing a Windows-powered tablet, as opposed to an Android tablet for now. But anything's possible. Regardless, it'll be much better than the Surface. its better for them to bring high end phones to regain their past position in mobile market. their product variety in phone market is low now and if they stick to producing tablets ( specially with windows OS) they'll loose their concentration on mobile part. You are joking right? There are so many Lumias in different sizes and geared at different buyers right now it makes my head spin. The tablet market makes sense especially if they hit the 7" market. That would be great for Nokia. please read first and then comment. look at what i said: "high end phones". now the only high end phone is L920 and it is about a year old. every company is introducing its 2013 flagship and it is not good for Nokia to show no reaction. Ehh MWC. ;) I don't think Nokia has been sitting around doing nothing with their latest winnings. i wish what you say about MWC be true but if there were something important, be sure that there were some leaks like M7 or Sammy's tablets. Windows RT, 7inch, Please? Come on Nokia! That is a great screen size and it would put Windows in a good price range finally. Hmm...how many of you think that the title is slightly mis-leading? He (Elop) has spoken only about windows in all his above statements and has not indicated other options or platforms. 10.1" plus Windows Pro, 8.5" and under Windows RT for us who just want a tablet to play games and browse the Web. I have Windows 8 Pro on my Laptop for .exe action. No android W8 will the real host for Nokia's upcoming Ghost...(For Droids)..
A 7 inch tablet with PureView 1+2 would be a fantastic re-entry device for Nokia in this market. The larger camera sensor would be less obtrusive on this larger device and it would certainly differentiate it from the rest of the crowd. That, plus the PureMotion HD+ screen with CBD. Throw in wireless charging, MicroSD expansion and a HD WideAngle FFC for good measure. I just threw money at your comment! Imagine a 7' tablet with the L920's charms and fatures. Nokia is now making profits on sales of their phones. I am a windows phone fan but have felt that if Nokia could afford it that Nokia should make Android smart phones and tablets. If Does make a Windows tablet it should be at least an Atom powered Windows 8 Tablet. 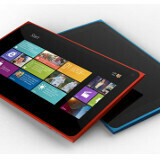 The Windows RT OS surface Tablets may not be selling as well as the Tablets running Windows 8 OS. Since Nokia can only afford to commit a limited amount of funds to Selling Tablets Windows 8 OS Tablets are the Safe bet to make because it can run old Windows software as well as the new " Modern User interface" touch screen only Apps. Hope they will not use Android, but i have a feeling that they might make a nexus phone! Hope they can use Meego for the tablet that would be awsome! But if they made a Windows tablet i would buy it. I can already imagine: PureView camera, PureMotion HD+ and ClearBlack display, Qi... what else?